Purrl, Ruby and Alma delighted is a sunny day by going tree climbing. Purrl is out on the limb of a small bush. The cats laugh at her I'm sure. She can climb regular trees perfectly well but she loves to hang off the ends of bushes. Sources from Bits and Pieces.us. Mary MacADNski: Can you imagine? Where both of my brothers live (at different ends of the country)this would be entirely possible. Mary MacADNski: They were enjoying the 10 degree temps. Mary MacADNski: They were enjoying the 10 degree temps, as was I.
Delightful selection, not sure about the dog though has it been GM'd. Mary MacADNski: You're right. With that many legs it might just be genetically modified. I'm not surprised that they have legged it up trees if that's the usual size of a dog I see little legs behind the moose, too! Mary MacADNski: Yes, I had noticed the other legs. 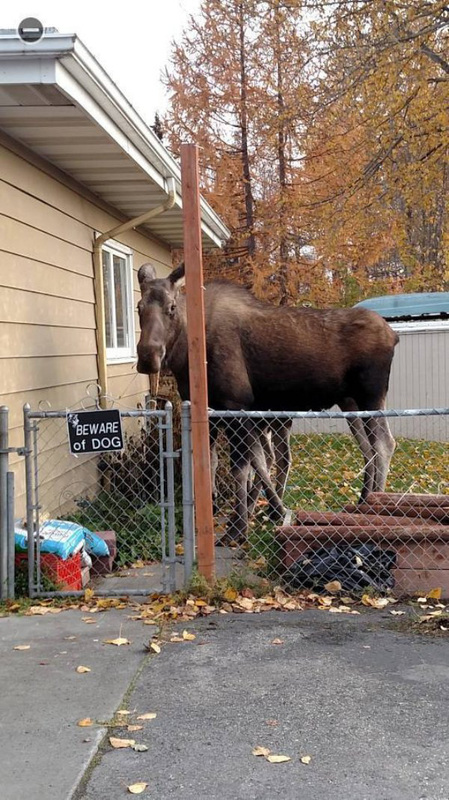 You must have run across moose in your travels. Mary MacADNski: We don't have moose on the island but do where I am from in New Brunswick. I credited this with bitsandpieces.us. Mary MacADNski: Big dog that you don't want to meet with a vehicle with those spindly legs and odd center of balance. Mary MacADNski: I love the dog! The cats are having a fine time. All three shots are really great, Mary! Those cats are so pretty! Mary MacADNski: Thanks, Madan. The cats are so beloved. They are my Valentines today. Mary MacADNski: All in the same tree. They were feeling frisky.